River Valley’s Trevor Simpson carries the ball during the Raiders Tri Valley Conference Ohio Division contest on Sep. 14 in Bidwell, Ohio. Last Week: Gallia Academy defeated Fairland 53-35, in Gallipolis; Coal Grove defeated Portsmouth 36-34, in Coal Grove. Last meeting between the teams: Oct. 6, 2017. Coal Grove won 33-20 in Gallipolis. Current head-to-head streak: Coal Grove has won 2 straight. GAHS offense last week: 357 rushing yards, 135 passing yards. CGHS offense last week: 246 rushing yards, 129 passing yards. GAHS offensive leaders last week: QB Justin McClelland 11-of-14, 135 yards, 1TD; RB Jacob Campbell 21 carries, 143 yards, 5TDs; WR Cade Roberts 5 receptions, 54 yards, 1TD. CGHS offensive leaders last week: QB Nate Harmon 10-of-18, 129 yards, 2TDs; RB Austin Stapleton 19 carries, 94 yards; WR Aaron Music 4 receptions, 71 yards. GAHS defense last week: 101 rushing yards, 299 passing yards. CGHS defense last week: 323 rushing yards, 30 passing yards. 1. GAHS had defeated Coal Grove in five straight meetings prior the Hornets’ current win-streak in the series. Coal Grove holds a 10-8 edge in the all-time series, and won 67-13 the last time they hosted the Blue Devils, on Oct. 7, 2016. 2. Last week, the Blue Devils scored over 40 points for the fourth time this season. The last time GAHS scored 40-or-more at least four times in the same year was 2013. 3. The Blue Devils have rushed for a more than a mile this season, 1,763 of their 2,466 total yards. GAHS has scored at least one rushing touchdown in every game, and has found the end zone on 29 carries this fall. 4. These teams have three common opponents to this point in the season, in River Valley, Chesapeake and Portsmouth. GAHS went 3-0 against the trio, outscoring them by combined 135-to-27 count. CGHS defeated RVHS by 47 and PHS by seven, but fell to Chesapeake by a 35-28 count. 5. The Blue Devils enter the week at third in the Region 14 rankings. Gallia Academy is one of five teams in the region with at least five wins. Coal Grove enters the week at 11th in the Region 23 rankings, and is one of 13 in the region with a winning record. Last Week: River Valley lost to Wellston 20-0, in Bidwell; Alexander defeated Vinton County 17-14 OT, in McArthur. Last meeting between the teams: Oct. 6, 2017. River Valley won 27-15 in Bidwell. RVHS offense last week: 68 rushing yards, 30 passing yards. AHS offense last week: N/A. RVHS offensive leaders last week: QB Dylan Lemley 5-of-7, 30 yards, 1INT; RB Dylan Lemley 14 carries, 34 yards; WR Jared Reese 2 receptions, 19 yards. AHS offensive leaders last week: N/A. RVHS defense last week: 271 rushing yards, 8 passing yards. AHS defense last week: N/A. 1. The last four meetings between these teams have been split, with the Raiders winning 50-7 in their last trip to Albany, on Oct. 7, 2016. 2. Dating back to last season, RVHS has lost nine consecutive games, matching the team’s longest skid since 2010. 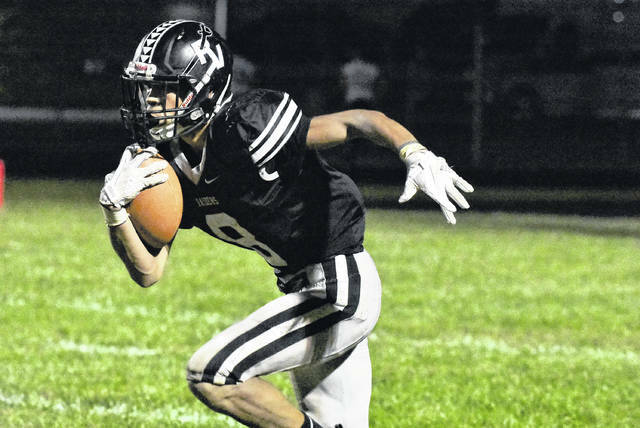 Last Week, the Spartans snapped their 14-game Tri-Valley Conference Ohio Division losing skid. 3. The Raiders won the turnover battle by a 3-2 count last week. The RVHS defense has four interceptions on the season, and has allowed just 609 passing yards to go with seven passing scores. 4. RVHS has been shut out three times this fall, after having gone two seasons without being blanked. Before this year, Alexander was the last team to shut River Valley out in the regular season, doing so in Week 7 of the 2014 campaign. 5. Wellston is the only common opponent between these teams to this point in the season. The Silver and Black held Wellston to 20 points last week, while Alexander allowed the Golden Rockets to score 49. Last Week: Belpre defeated Federal Hocking 41-8, in Belpre; South Gallia lost to Southern 54-12, in Racine. Last meeting between the teams: Sept. 29, 2017. Belpre won 52-13 in Belpre. Current head-to-head streak: Belpre has won 6 straight. BHS offense last week: 332 rushing yards, 0 passing yards. SGHS offense last week: 187 rushing yards, 5 passing yards. BHS offensive leaders last week: RB Jesse Collins 9 carries, 162 yards, 3TDs. SGHS offensive leaders last week: QB Tristan Saber 4-of-6, 5 yards, 1INT; RB Kyle Northup 21 carries, 69 yards, 1TD; WR Kyle Northup 2 carries, 15 yards. BHS defense last week: 123 rushing yards, 123 passing yards. SGHS defense last week: 149 rushing yards, 135 passing yards. 1. South Gallia has struggled with Belpre in recent years, not having won against the Orange and Black since Oct. 7, 2011, by a 62-7 final. Belpre was 0-10 that year. In the last six meetings, BHS has outscored SGHS by a 189-53. The Rebels lost 30-20 the last time they hosted Belpre, on Sept. 30, 2016. 2. The Rebels have earned more first downs than their opponents in each of the last two games, and five games overall this season. South Gallia has made 4-of-8 extra-point kicks this season, while going 1-of-5 on two-point conversion tries. 3. South Gallia has rushed for 1,309 of its 1,539 total yards this season, along with 12 of 13 touchdowns. The Rebels have allowed 12 rushing scores and six passing touchdowns, along with four defensive touchdowns and one special teams score. 4. South Gallia has turned the ball over 18 times this season, with 10 lost fumbles and eight interceptions. The Rebel defense has 11 takeaways, including a trio of interceptions. 5. Belpre is currently 12th in the Region 23 rankings, and is one of 13 teams in the region entering the week with a winning record. South Gallia is 23rd in the Region 27 rankings, and is one of six one-win teams.